I hate gratuitous destruction videos. You know, the ones that ask “what happens if we drop a red-hot ball of Plutonium onto a bag of Cheetos?” There’s a lot of smoke, flames and a big pile of ad revenue for the idiots behind it. This destruction video is a little different, though. [Tesla 500] wanted to mount his high-speed camera onto a rotating blade, but without destroying the camera. In this video, he documents the somewhat nerve-wracking process of building a rig that spins a $3000 camera at several thousand revolutions per second minute. It’s all about the balance, about building a rig that balances the weight of the camera and the blade properly at high speed. It took several attempts to get it right, and [Tesla 500] shows how he tested and refined each version, including shifting weights to account for the different densities of the camera itself, which has the heavy batteries at one side. And then he drops things onto the blade to see what they look like when sliced. Naturally. [Bill] wants a little piece of mind when his infant is sleeping in the other room. For him, the audio-only baby monitor could use some improvement. 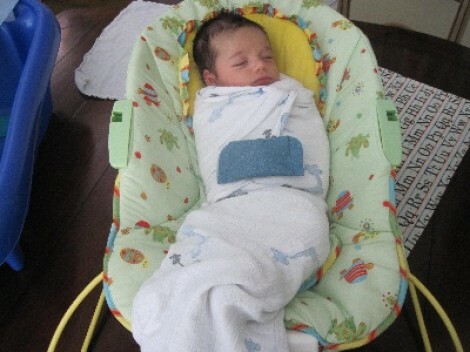 His proof-of-concept is that blue patch Velcroed on the swaddled infant. It monitors movement, orientation, and temperature and alerts you when something’s amiss. Inside the pouch you’ll find a TI Chronos eZ430 wristwatch with the band removed. It’s a nice hardware choice because it includes an accelerometer, temperature sensor, and RF link to a USB dongle. [Bill’s] code sends a data packet to the PC about once a second. The PC watches to make sure there’s slight motion, indicating the baby is breathing. This part doesn’t work all that well as the accelerometer doesn’t pick up tiny movements all too well, but it does have potential. In the video after the break you can see the functions which make sure the baby doesn’t roll onto its belly, and that she’s not too cold do work extremely well. We wonder if the accelerometer would pick up more motion if the watch was hung from a string inside of a small enclosure. This way it would swing back and forth with small movements. But perhaps that would make the whole thing too bulky? The [Fédération Internationale de Football Association] is joining the growing list of professional sports that is adopting technological means in an attempt to help the human referees. After a botched call in 2010 the organization called for a system that would work day or night, with 100% accuracy and the ability to report to the Refs in less than 1 second. The applicants have been weeded out and it comes down to two systems, both of which use a piece of personal hardware we’re quite familiar with. [Fe80], who sent in the tip, recognized the TI Chronos eZ430 watch in the image above. The two systems both use the watch as an interface, but work very differently. 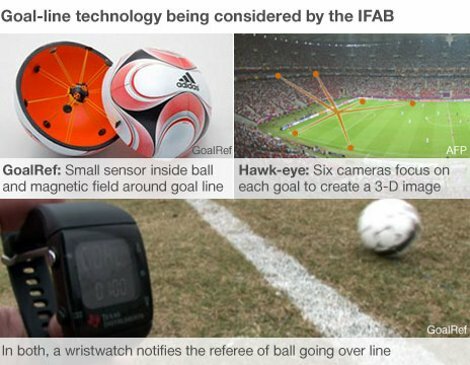 The first, called GoalRef, uses a sensor suspended inside the ball. This detects a magnetic field made up by the goal posts. We’d guess it’s an inductance sensor that is triggered when it passes a coil in the goal posts (we didn’t find much in the way of technical info so please do your own speculation in the comments). The second system is very familiar. It’s the Hawkeye camera system used by the APT (Tennis) in all the major tournaments. [Mike Field] was working on interfacing his TI Chronos eZ430 watch with the Raspberry Pi. As things were going pretty well, he took a side-trip from his intended hack and implemented watch-based control for an RPi audio player. It really comes as no surprise that this is possible, and even easy. After all, the RPi board has native USB capability for hosting the watch‘s RF dongle, and it’s running Linux which we know already works well with the Chronos platform. But we still love the thought of having automation controls strapped to our wrist! mpg321 is the audio playback program used for this hack. 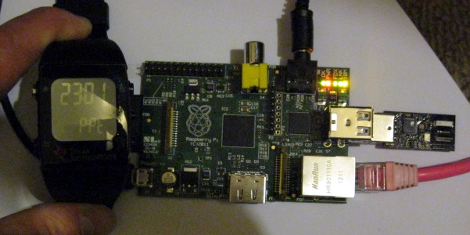 It plays MP3 files using ALSA for sound, which does have a few hiccups on the RPi. [Mike] found workarounds and included them in the C program he uses to gather everything into one nice code package. Control depends on keypresses sent from the watch (meant for use with PowerPoint) which are translated by his code and pushed to the audio/mp3 programs. Take a few minutes and watch [atlas of d00m], at Shmoocon 2012, presenting information about using the RF dongle from the Chronos to explore ISM bands. Admittedly, I’m not very familiar with many of the things he discusses, but the words make sense. The bits and pieces I am familiar enough with to comprehend are truly fascinating. He covers typical methods of RF modulation as well as some hardware specific information to that dongle. If you have a few minutes, or want more security related stuff, check out all the coverage from Shmoocon 2012. Tons of great videos here. [Lars Kristian Roland] is using a wristwatch to control this rover. 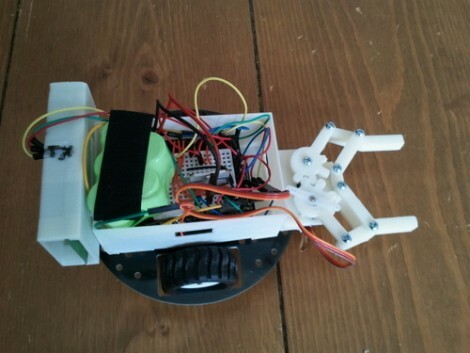 The bot itself is a utilitarian build with a gripper based on this Thingiverse project. 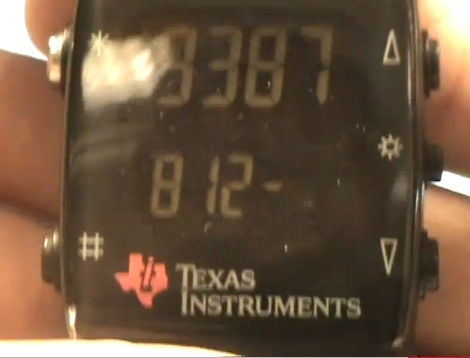 As you can see in the video after the break, it’s got variable speed control based on accelerometer data from a TI ez430 Chronos wristwatch. The watch connects to the bot wirelessly thanks to a CC1110 development board which relays communications to the on-board Arduino through a serial connection. It looks like it’s a bit of a bother to make slow and precise movements using this setup, but this can probably be changed by tweaking how accelerometer values are interpreted (using a non-linear equation would allow you more control at low speeds without sacrificing top speed for the motors). Because this is using the same RF hardware that the IM-ME does, we can’t help but wonder if the CC1110 development board could be swapped out for an unused IM-ME dongle?